Lung Cancer Europe Report launched in the EU Parliament - Lets Reduce Disparities: What Must We Do? For the second consecutive year, the Lung Cancer Europe Report was officially launched during an event in the EU Parliament, hosted by Mr. Alojz Peterle, President of MEPs Against Cancer Group and attended by relevant stakeholders. The 2nd Report of LuCE focuses on the persisting disparities among European lung cancer patients in terms of access to diagnostics, innovative drugs and healthcare services. As patients and patient advocates, we are actively committed to working together with other partners in order to address these challenges and to ensure that the unequal condition of lung cancer patients in EU is being prioritised in legislation and regulations. Between 2010 – 2014, 49 new cancer medicines were launched, but only 6 countries had access to at least half of them, as showed by Prof. Tanja Cufer during her lecture and the availability of lung cancer molecular tests and the radiotherapy facilities were not equally provided in every country. 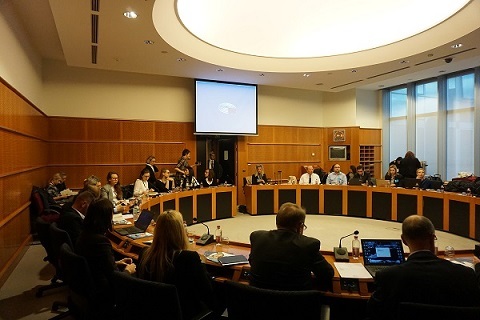 Patients, politicians, physicians, patient advocates, media, pharmaceutical industries and economists, attended this event, in which the current lung cancer scenario and the reasons of the unequal accessibility to diagnosis, care and treatment in Europe were discussed and analyzed from different perspectives. According to Mr. Peterle, “it is strongly important to continue with such meetings in order to raise the public, but primarily the political awareness on important issues such the access to new treatments”. He thanked Lung Cancer Europe for organizing this event and for promoting early diagnosis and equal chances for all patients, two important goals that require policy and decision makers must work together in order to respond these needs. “Improving the access to medicines is indeed a multi-stakeholder responsibility”, as stated from Malvika Vyas, ESMO Head of Policy that added “major societies, including ESMO, share the will and the responsibility to lead the public policy debate on equitable access to anti-cancer therapies across borders”. “This report will play a crucial role in informing the policy makers and we urge all supporting organizations in every country to use this report for making some changes in the national lung cancer environment”, declared Regine Deniel Ihlen, lung cancer survivor and LuCE treasurer. This report aims to be a tool for different national and EU level stakeholders, used as a source of reliable data to show how the problem is severe and how it requires to be addressed very soon.